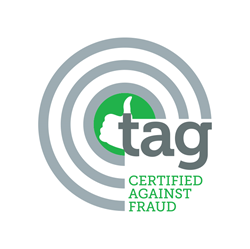 MyWebGrocer (MWG), the leading enterprise software and digital media company to the grocery and Consumer Packaged Goods (CPG) industries, announces that is has been awarded the TAG “Certified Against Fraud” Seal from the Trustworthy Accountability Group (TAG), an advertising industry initiative to fight criminal activity in the digital advertising supply chain. TAG supports the development of common standards to combat digital ad fraud, malware, and piracy in the digital advertising supply chain. TAG’s rigorous anti-fraud certification process ensures entities adhere to strict requirements based on their roles in the digital advertising supply chain. MWG completed all of those requirements, including complying with the Media Rating Council’s (MRC) Invalid Traffic (IVT) Detection and Filtration Guidelines, domain list filtering, data center IP list filtering and publisher sourcing disclosures. The TAG “Certified Against Fraud” Seal recognizes MWG’s achievement for its commitment to advertising transparency. If you would like to download a copy of MWG’s whitepaper, How to Protect Your Brand and Your Digital Media Investment with Brand Safe Environments, please visit: http://go.mywebgrocer.com/Brand-Safe-Environments.